Desktop computers have come in two flavors for the last few years: boxes you plug into your monitor or TV, and all-in-one devices like Apple’s popular iMac line. Microsoft’s newly announced Surface Studio is the latter kind of desktop, but with a giant touchscreen and pen input too. It’s also the first desktop computer Microsoft has ever made. And it’s unlike anything else out there in the world. The Windows giant has notoriously avoided the desktop hardware market, letting companies like HP and Dell duke it out instead. So the Surface Studio, which is clearly targeted towards artists, creatives, and power users, is a major departure. The last shock Microsoft delivered that was this monumental was the introduction of the original Surface back in 2012. The Surface Studio has a 28-inch touchscreen that accepts pen input, much like the professional Cintiq from Wacom. It’s a big desktop computer of the slab variety, and because it’s a slab, it can easily be adjusted for better viewing angles or drawing angles. According to Microsoft, the Studio has the thinnest LCD of its size ever made. It’s just 12.5mm. The computer’s display has 192PPI, which is less dense than the 218 PPI 5K iMac, but certainly nothing to shake your fist at. The display has a DCI P3 color gamut, one of the largest color gamuts currently available. DCI P3 is what filmmakers calibrate their monitors to when creating films and TV and what the current 5K iMac is capable of. The Studio is built around that gorgeous display, but rocks some decent specs, including an Intel i7 processor and a Nvidia 980M graphics. The 980 is one generation behind the current top of the line, but it’s still a powerful video card that should be more than capable of handling most current games and video editing demands. You can spec the device at up to 4TB of storage, and up to 32GB of RAM. The Studio also has a dial accessory, appropriately called the Surface Dial, which looks incredibly useful for video and audio editors. It allows a user to quickly scroll through huge projects or timelines. To make the dial it useful for artists, it can actually be put onto the Studio’s display to reveal a dial of colors, so that you can quickly select the proper hue without lifting a pen from the device. The dial also allows you to quickly zoom in and out to see the entire project or focus on one tiny detail. As all-in-one computers go, the Surface Studio is undoubtedly the most attractive currently available, but it’s certainly not the most powerful. MSI makes one with the latest Nvidia video card built in. This is a device that’s design first, and power second. 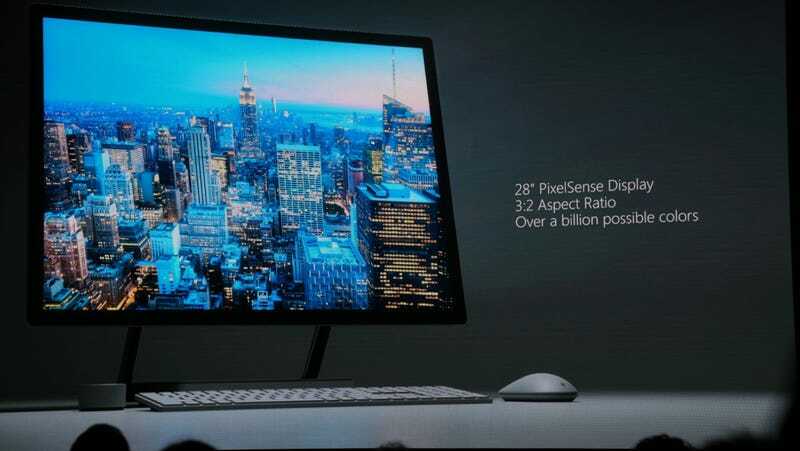 Pre-orders start today for the Surface Studio start today, prices start at $3000. For the average user that price is insane, but for a creative professional, it’s not a terribly bad deal. A computer and a Cintiq display with similar capabilities and less remarkable colors would run for a similar price.